Explore all the different sessions that we run. 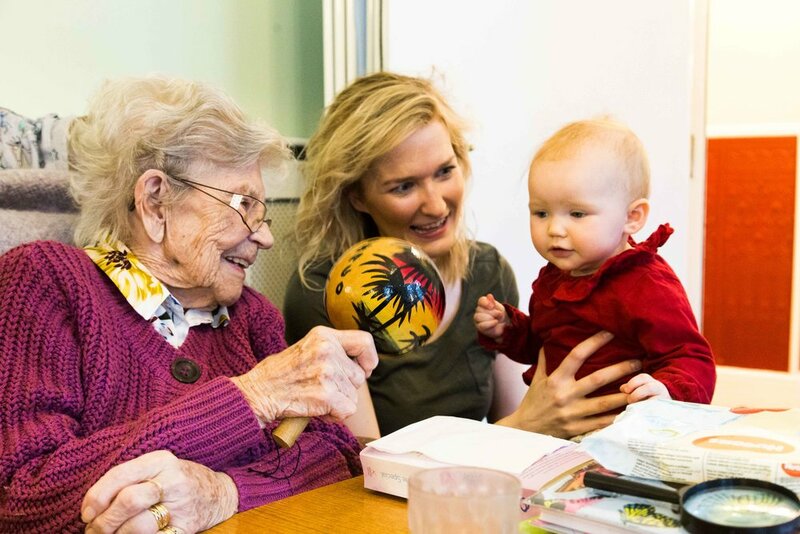 Intergenerational care home visits involves babies, children and young adults visiting care homes, dementia cafes, day centres and sheltered housing sites. At the sessions, people can chat, play games and interact with older people to help reduce loneliness and promote kindness. Intergenerational visits have been proven to not only benefit the older generation but also benefit young people. For children, interacting with older people can help with their development, ability to form friendships and also encourage them to communicate effectively. For older children, these visits can help with their ability to empathise with others and can result in meaningful friendships and a means of support throughout their adolescent years. * These visitors must be accompanied by a parent or guardian. Sing, Rhyme and Move - A music and movement session for little visitors (0-5 years) to enjoy with their older friends. Monthly at Chiswick House Care home in Norwich and King’s Lynn care home. Plus pop up sessions at various locations. See Facebook events for more details. Wiggle and Jiggle - A music and movement session for little visitors (0-5 years) and junior visitors (6-10 years) to enjoy with their older friends. Monthly at Burlingham House care home in North Burlingham. Plus pop up sessions at various locations. See Facebook events for more details. We work with schools in Norfolk and Suffolk to assist visits and projects with local care homes. We provide project ideas, support and guidance. Our previous school projects include; poetry, music, games, befriending and memory box projects. We ask schools that we support to do at least one fundraising event for us during the academic year. We run a pen pal scheme that links schools and other educational provisions to care homes. The pen pal scheme includes letter writing, sending pictures and examples of class work. This scheme is open to schools across the UK and abroad. We run one off events that give younger and older people an opportunity to come together in the community. We annually host an Intergenerational Sports Day and a Norfolk Day celebration.